Our topics this term are "Dinosaurs" and "Circus". Alongside daily reading, Bug Club and the weekly page from your CGP Mental Workout maths books, Take-Away Tasks (in place of weekly homework tasks) can be completed at any stage over the half term, and brought in to school upon completion to share with your teacher and class by Friday 5th April. Beech and Chestnut class have PE on a Friday. Children need to have a swimsuit or swimming trunks and a towel. Goggles are optional. All children MUST have a swimming hat. Hats are available to purchase from the office for £1.50. We met a real T-Rex called Milly! We measured a dinosaur footprint using our shoes. We measured a dinosaur footprint using counters. 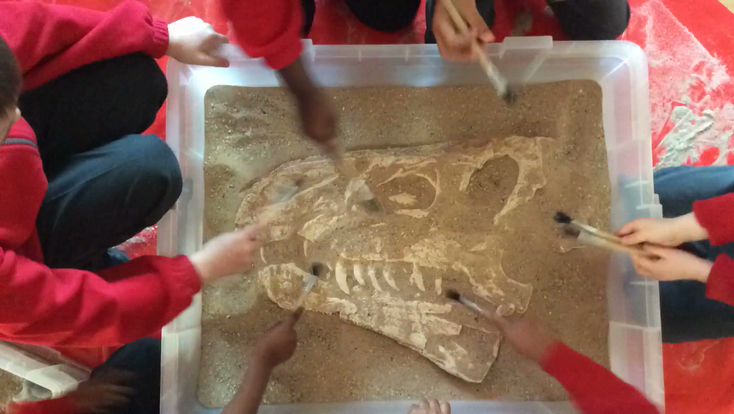 We were palaeontologists for the day. We went on a shape hunt around the school. We have been using sound mats in our writing. We have been sequencing familiar stories. For Black History Week, we studied the artist Stephen Wiltshire, who creates amazing drawings of city skylines, entirely from memory. We created our own skylines, first using paper shapes, then using 3D building blocks. In science, we labelled humans and animals. We have been practising our writing.